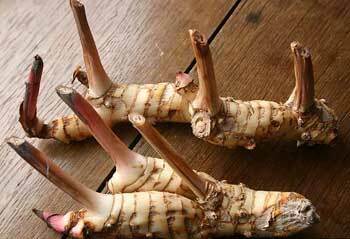 Galangal is a perennial plant; the creeping rootstock is cylindrical and branched, ringed with the leaf sheaths of the past, rust brown or red outside, and gray-white and mealy inside. 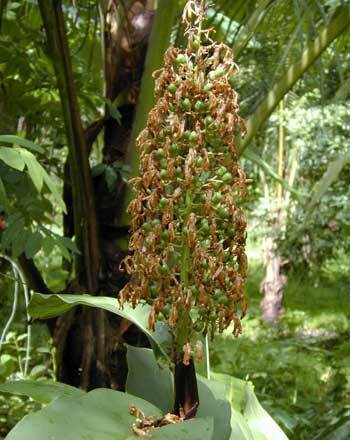 Its odor and taste are reminiscent of its relative, ginger. Aside from the basal leaves, procumbent stems also bear linear-lanceolate leaves as well as white flowers growing in racemes. During flowering, the plant reaches 3-5 feet in height. Found wild and cultivated in China, Southeast Asia, Indonesia, and Iran. Appetizer, carminative, diaphoretic, sialagogue, stimulant. Lovers of the Middle Ages (not middle-aged lovers) used galangal as an aphrodisiac. Galangal is a peppery, aromatic, and gingery flavored root spice that was popular many centuries ago, but apparently does not suit most modern tastes. In Europe galangal is used to flavor vinegar, beer, aperitifs, and liqueurs. A 1525 herbal recorded the use of galangal; used as a catarrh snuff (powdered form) and as a cattle medicine. It is said that Arabs use this botanical to make their horses fiery. Used to spice a Russian liqueur, known as “Nastoika”. 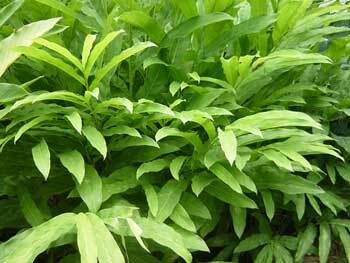 Tartars flavor their tea with a pinch of this root. A spicy herb used for colitis, diverticulosis, nausea, vomiting, motion sickness or sea sickness, gas, indigestion, paralysis of the tongue, morning sickness, vomiting, hot flashes and menstrual cramps. Cleanses the colon, stimulates circulation, and reduces spasms and cramps. Galangal tea or tincture, taken hot, promotes cleansing of the system through perspiration and is also said to be useful for suppressed menstruation. Take it to clear up flatulent colic or combine it with laxative herbs to make them more palatable or milder in action. Try it at the onset of a cold to ease the effects of the usual symptoms. Finally, to stimulate the flow of saliva and to soothe a sore throat, chew the rootstock as it is. Grated galangal can be topically applied externally, as a poultice or hot fomentation to relieve painful aches, sprains, and spasms. Infusion: mix 1/2 tsp. powdered rootstock with 1 tsp. (or more) honey. Add 1 cup boiling water. If desired, add an ounce of brandy or other liquor. Tincture: take 15 or more drops at a time, warm.